Take a look at these results from today's election. What's the point? 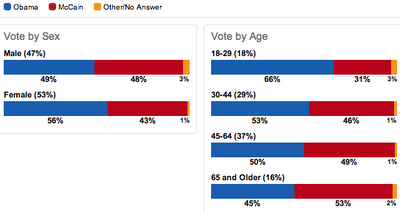 The point is that old people vote more conservatively. 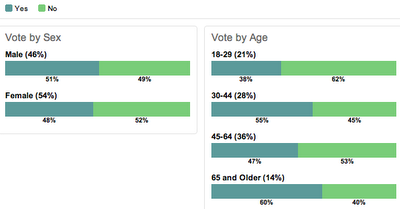 They vote like people would back in the day when they were young - when the U.S. was way more bigoted. Young people are ready to change things - they are more tolerant of people being different. Thus, they prefer the liberal candidate, don't have as much of a problem with the private lives of other people, and abortion is not such a hellish notion to young people. Things look good for the future. Tolerance in the U.S. is on the rise, and national values are changing. 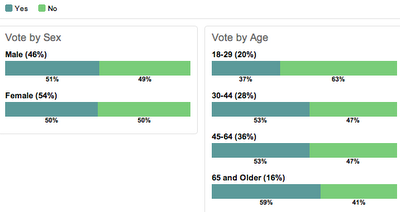 Young people today are better informed than old people were when they were young. They know more of the world, and having grown up seeing diversity they are more attuned to it. The dogmatic bigots are on their way out. Good for us.